By Mary Candace Evans and Holly Bauman | 11 years ago So many ministers lived on the 4300 to 4400 block in the 1930s that it became known as 8220 Bishop’s Row. By D Magazine | 11 years ago The national real estate market may be in a slowdown, but second homes continue to be a hot commodity market. By Christine Lieb | 11 years ago Nonna’s Julian Barsotti talks buying local produce, cooking at home, and spices he can’t live without. By D Magazine | 11 years ago The Stanley Korshak’s Home Accessories Buyer gives us his design book picks. 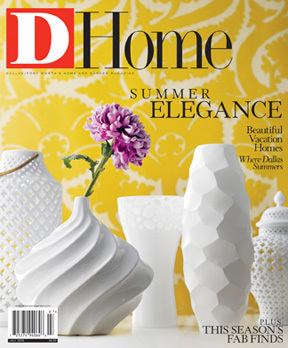 By D Magazine | 11 years ago Geometric shapes add elegance and drama to your living room. By D Magazine | 11 years ago The real estate market might be in a slump, but second homes are still not. From the African wilds to the not-so-wild West, remarkable retreats beckon the Dallas elite. By D Magazine | 11 years ago Physician Alan and designer Kathleen Munoz wanted a vacation getaway of their own. Though the couple needed to stay close to Dallas, they hoped for a completely different feel from the city. They found that and more on Lake Whitney. By Mary Candace Evans | 11 years ago Kimberly Schlegel Whitman: Martha Stewart meets Nan Kempner meets Donald Trump. By Peggy Levinson | 11 years ago Architects and designers are taking their cues from the green movement and finding new uses for old stuff.